Dam or Damn – What’s the Difference? Home » Dam or Damn – What’s the Difference? Words that are pronounced the same but have different meanings are called homophones in English. Homophones are common in many languages, and English has enough of them that they have confused every writer at some point. Damn and dam are homophones. They are pronounced identically, but don’t mean the same thing. Actually, they aren’t even the same part of speech. Writers unfamiliar with the nuances of English spelling might confuse one of these words for the other, and since damn is sometimes considered a profanity, they might get themselves into trouble. Thus, you will save yourself and your readers time and energy by using each word correctly. What is the Difference Between Dam and Damn? In this post, I will compare dam vs. damn. I will use each word in at least one example sentence, so you can see how it appears in context. Plus, I will show you a helpful memory tool that you can use to make choosing dam or damn a little simpler. What does dam mean? Dam is a noun. It refers to a structure that blocks water or other liquids from passing. Humans build dams across rivers as a source of energy, to change the direction of the water, or to stop the river entirely. Beavers also build dams and live in them as homes. One hundred and twelve workers died while building the Hoover Dam during the Great Depression. If you look closely, you can see a beaver poking its head above its dam on the river. What does damn mean? Damn is a verb. It means to condemn someone or something. Its related noun is damnation. The conjugations damning and damned can also form adjectives, like in the phrase damning evidence or out, damned spot. Many people consider damn a profanity. It’s probably in your best interest not to use this word in a school or around unfamiliar coworkers, unless you work in a casual setting where profanity is commonplace. “Damn you all to hell!” screamed the cattle thief as he was being tarred and feathered and paraded out of town. “Well, damn me, you’re right,” exclaimed the police officer as the detective presented his findings. Damn is pronounced the same as dam– the N is silent. These words also rhyme with sham, clam, and spam. If you are referring to a structure built across a river by humans or beavers, use dam, with no N. If you are using the word as a synonym of the verb condemn, use damn. 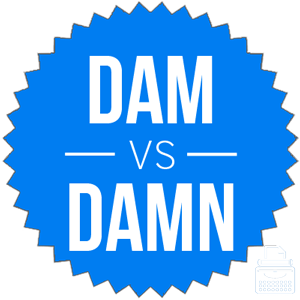 Damn vs. Dam Check: Since both condemn and damn end with the unusual -mn combination, it should be easy to remember that they mean the same thing. Is it damn or dam? Damn and dam are homophones, but they are different parts of speech. Damn is a verb that means condemn. A dam is a noun that refers to a structure built across a river to stop or slow down the water. Even though they sound the same, they are not interchangeable in any contexts. 1 What is the Difference Between Dam and Damn? Criticise vs. Criticize – What’s the Difference? Foolproof or Fullproof – What’s the Difference?